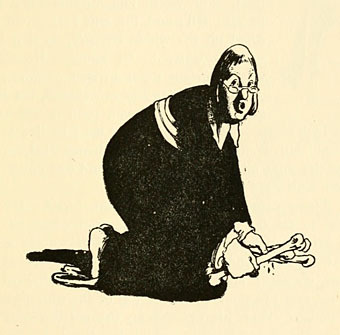 Letterpress relief printing, used to reproduce fairytale illustrations for 19th century and early 20th century books, refers to “any printing process by which the printing ink is transferred to paper, etc., from areas that are higher than the rest of the block, as letterpress printing" (Butler, 2013). 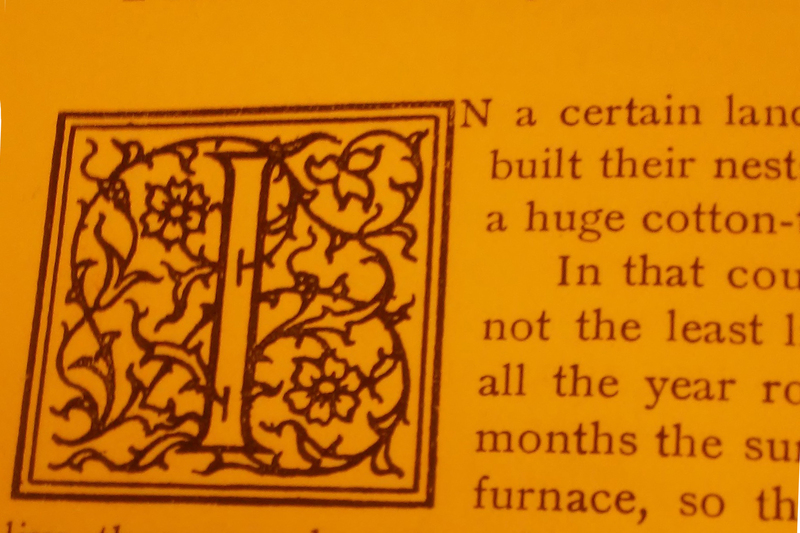 Illumination printing refers to "Printed or hand applied decoration in different colour of initial letter, chapter heads, tail pieces, vignettes, etc." (Elsevier, 1967). 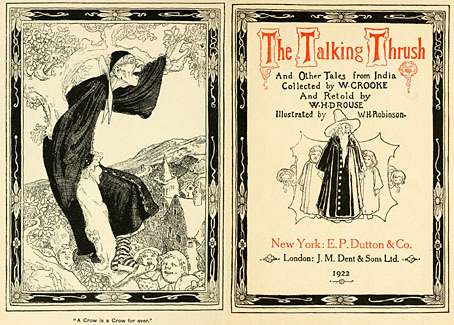 In this post, we examine these techniques in The Talking Thrush and Other Tales from India (Crooke, W. and Rouse, W.H.D. 1899;1922; SDSU Juvenile Collection Call number 398 R863 T14) by W.H. Robinson. These effects are emulated Chris Riddell's 2016 illustrations for Sleeper and the Spindle. 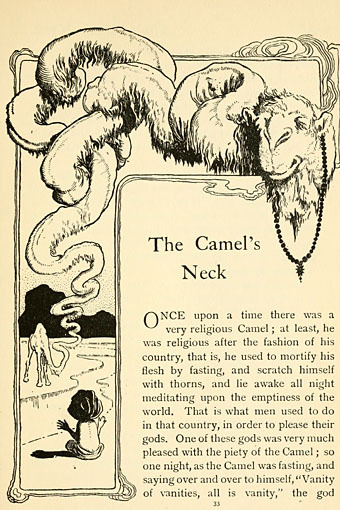 For example, Robinson's bordered index illustrations like "The Camel's Neck" align with, frame and overhang the text, and his illustrations break out of the frame for a three dimensional illusion. printing through a press, including color lettering from a second pass through the press. Borderless portraits of central characters have the same relief texture illuminated script captions in white space are classic design techniques from Robinson and his contemporaries. Sleeper and the Spindle pages with these large vined initials to each page. "Relief printing." The Macquarie Dictionary, edited by Susan Butler, Macquarie Dictionary Publishers, 6th edition, 2013. Credo Reference, http://libproxy.sdsu.edu/login?url=http://search.credoreference.com/content/entry/macqdict/relief/0?institutionId=1591. Accessed 17 May 2017. "Illumination." The Dictionary of the Printing and Allied Industries:in four languages English, French,German, Dutch (New York: Elsevier, 1967).